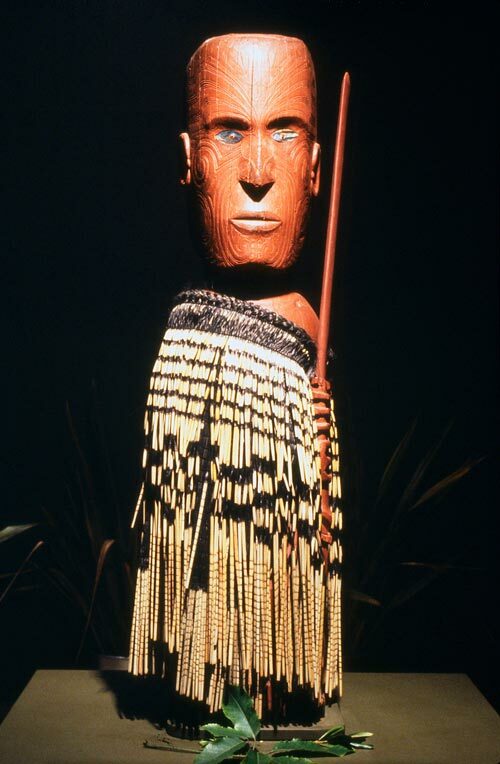 This carved figure is of the famed Te Arawa ancestor, Houmaitawhiti. Houmaitawhiti's dog Pōtaka Tawhiti was killed by a chief, Uenuku, who had witnessed it breaching tapu. Houmaitawhiti's sons Tamatekapua and Whakatūria became involved in a number of skirmishes with Uenuku. Ultimately, this led to Tamatekapua leaving the island along with his people as captain of Te Arawa waka. Permission of Rotorua Museum of Art and History Te Whare Taonga o Te Arawa must be obtained before any re-use of this image.